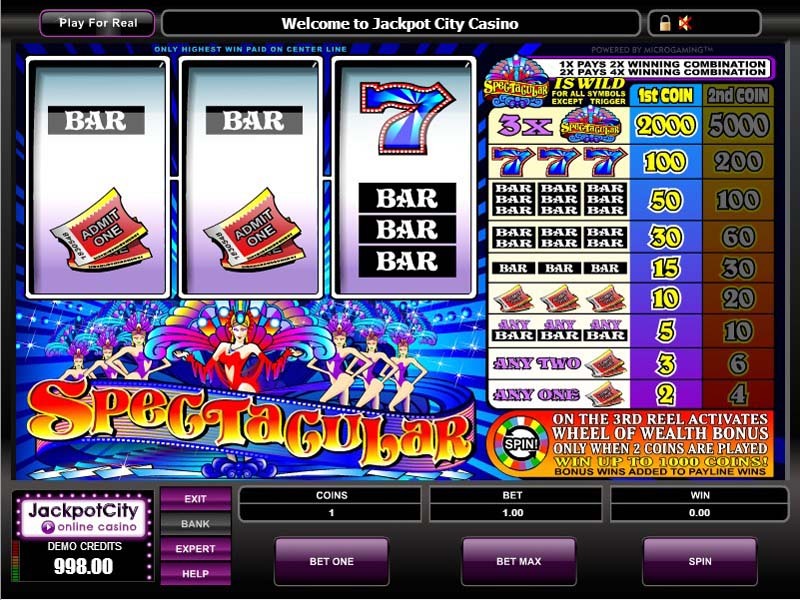 Spectacular is a classical 3 reeled slot machine by Microgaming. This game captures the spirit and the soul of classical and traditional slot machines that players enjoy at land based casinos and gambling venues. The game has 3 spinning reels and one winning line. The design, layout and interface of the slot machine resemble the same appearance of classical slots. The reels can be found on the left side while the paytable of the slot can be found on the right side. This paytable shows players all of the different combination of symbols that will make them eligible for a payout. It also features the special symbol, the wild symbol. This symbol is the dancer with the word Spectacular at the bottom. This symbol can substitute any other symbol as well as paying the highest reward that the game has to offer. Players will place their wagers at the bottom by choosing to place one or two coins. The paytable shows players what will they win if they bet one or two coins. This way players can always know what they will win before spinning the reels.